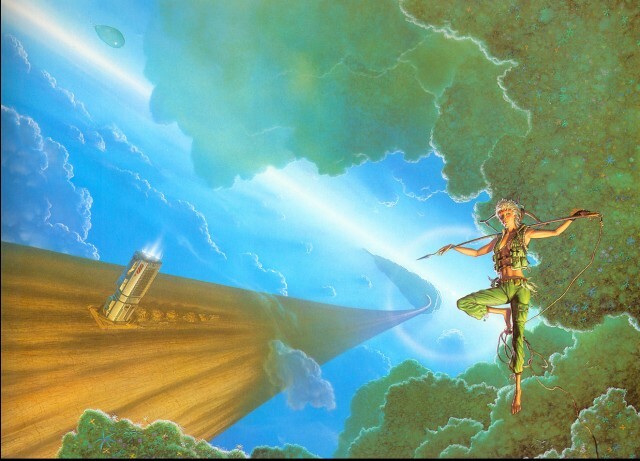 When I review hard SF, I often loathe to give away juicy details about the setting, because discovering them is part of the joy of reading such books. I don’t really have such reservations with Integral Trees because Niven front-loads most of the hard science into a gigantic expository dump in the first few dozen pages. Everything you need to know about the setting is condensed at the beginning of the book, accompanied by helpful diagrams that help you understand it. So I don’t really feel bad for spoiling it here. Imagine a binary solar system composed of a neutron star and a regular main phase yellow star. The neutron star has a single captured satellite, which happens to be a gas giant in an unusually low orbit just beyond it’s Roche limit. Because of the tidal forces acting on the planet in such a low orbit most of the lighter gasses from it’s atmosphere have been siphoned out into a vast gas torus surrounding the neutron star. The torus is about a million kilometers thick, and it’s dense core (known as the “Smoke Ring”) is composed almost entirely from nitrogen, oxygen and hydrogen forming a breathable atmosphere. The companion yellow star provides ample sunlight allowing life to flourish and evolve within the narrow gas ring. The Smoke Ring is essentially a world of endless sky. There is no solid ground anywhere within the ring, but water is plentiful. Of course since everything is in free-fall, it does not form lakes or rivers but rather coalesces into spherical floating globules. Most of plants and animals that inhabit the ring are free fall adapted, capable of limited flight and possess trilateral symmetry allowing them to see in all directions without repositioning. Plants, on average are fragile, spindly and tend to form dense clumps, using foliage and web-like branches for both photosynthesis and capturing and sieving up organic matter from the air, as it floats by. Picture of the spherical plant life clumps within the smoke ring. The one exception to this rule are the titular integral trees, which are absolutely massive. The largest of the trees grow up to about a hundred kilometers in length, and are tidally locked with respect to the neutron star. Their center of mass is located at the mid point of the trunk, and both ends terminate in a tuft of foliage. The tuft ends are typically subject to gale force winds which causes them to bend in opposite directions, giving the plants the characteristic, integral-sign shape after which they were named. The tufts collect water and floating debris to and provide natural shelter for all kinds of smaller animals, and parasitic plants. The tidal forces create a gravity like effect, that pulls nearby objects toward the trunk. Any water that collects on the trunk is pushed towards the tufts, creating little streams and rivulets across the bark. As a result each tree is it’s own, tiny, self contained ecosystem. This is probably why they were chosen by human colonists who discovered the torus roughly five hundred years before the events described in the books. The original settlers were mutineers who have rebelled against the oppressive totalitarian state, and escaped into the the smoke ring, and established a new civilization there. Most build communities within the tree tufts, or in the radial jungles. Because resources required to build industry (such as heavy metals) are scarce in the Smoke Ring they live simple rural lives, holding on to the few old technological gadgets they were able to preserve and keep in working condition. In most communities the post of a “Scientist” is akin to that of a shaman: a community healer and spiritual leader, who consults ancient records to get insights into the true nature of things. 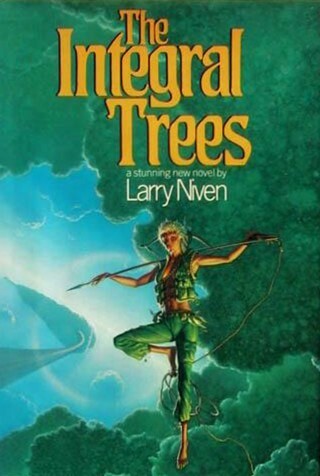 The picture from the expanded cover, featuring the bending trunk of an Integral Tree. This is a fantastic, and incredibly imaginative setting. But once you read through the first chapter, you basically know all there is to know about it, at which point you might as well just close the book and do something else. The rest of the book is just boring people, having boring adventures. The few revelations about the setting that have not been jam-packed into the introduction, are delivered in the laziest way possible. In most cases the characters simply read a paragraph of notes left behind the original settlers, and then complain that they don’t understand what it means. It is obvious that these exposition dumps are intended for the readers, since not even the tribal “Scientists” remember enough of the old science to decipher them fully. Bland characters and less than stellar conflict and resolution are not uncommon problems in the realm of hard SF. 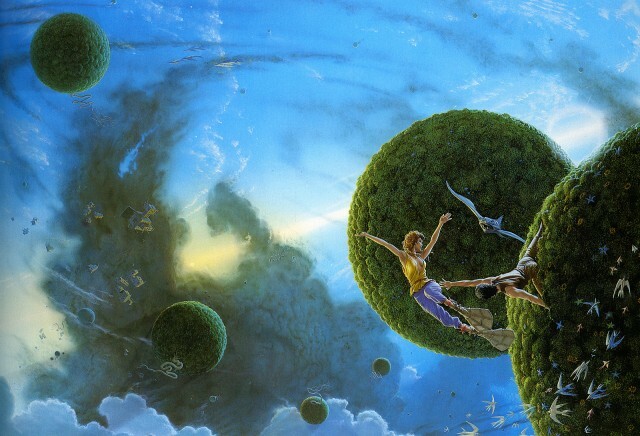 Writers who can deliver compelling science lectures wrapped inside space adventure novels often struggle to portray believable, characters that readers can relate to. The undisputed masters of the genre however tend to be aware of this, and route around the problem. Gregg Egan for example is really good at centering his novels around some novel scientific quagmire or mystery that the characters seek to solve. Even though some of his characters may be only broad personality sketches, they become relocatable due to sharing a common goal with the readers: the need to solve and unravel the same scientific puzzle. Egan also tends to make his protagonists somewhat odd, alien or somehow exceptional and unique: they are genderless artificial intelligences, disembodied post-humans and etc.. This often tricks the readers to latch that much harder onto the few human qualities they do display. Niven’s approach is the direct opposite of this. His characters are bland every-men, who neatly fit into a few standard archetypes they never seem to outgrow. All the interesting information in front loaded, or delivered in exposition globs, meaning he can’t trickle small revelations about the nature of the smoke ring throughout the novel. His book is constructed to rely on the strength of his characters. Unfortunately, none of them are likeable enough for one to care about their struggles. The cultures of the Smoke Ring are also extremely rudimentary and boring. One would think that since travel is difficult, and inhabitants for different trees rarely come into contact with each other, their cultures would vary. One would think that inhabitants of a free floating spherical jungle would live a drastically different than people who inhabit the trees. But the differences between all these people are mostly superficial. They use different governing systems (some more oppressive, other more democratic) but that’s about it. People of the Smoke Ring have no religions, no legends and no superstition. Their lives seem impossibly boring, shallow and petty. Even the one mildly interesting plot hook is completely wasted. The ancient ramjet used by the original colonists is still orbiting the gas torus. It is controlled by an AI which is still loyal to the state, and has spent the last five centuries plotting how to re-integrate the free people of the Smoke Ring back into the State. The ship and the diabolically intelligent entity that controls it are a constant threat, which never fully pays off. The book as a whole is disappointing. A fantastic setting ruined by poor execution, bland characters and uninteresting conflict. I didn’t read that book, but i find it strange that niven should lack story/characters that hard, since i found them to be pretty great in his known-space-stuff. But then in those stuff the setting isn’t that strange (at least apart from the ringworld itself, which gets introduced pretty much at the end), so maybe he just had his priorities a bit off in this one. The sequel had some interesting, character driven bits with the “dwarfs” – Smoke Ring inhabitants who were born with the standard human proportions. Everyone else in the novel is freakishly tall with elongated limbs and long, finger like toes toes. The Dwarfs were usually shunned because they were less adapted to life in the trees. But in the societies that still posses ancient space-suits, they are the only people who can operate them. Each one is basically the iron man of their tribe. It’s an interesting dynamic. The ship-bound AI could have been incredibly interesting if it was not so impotent. It almost felt like a recurring villain in a weekly TV show who has to be a constant threat without ever being a real danger.